Preparing for pregnancy, birth and life with a baby looks a little different for everyone. Because you have unique needs and a busy schedule, YOU will design the class that works for you. All 10 sessions flow together for a complete comprehensive preparation course. However, if you have budget or time limitations, you can choose the topics most important to you. I'd love to chat with you about your specific needs and how better beginnings can help you be confidant and prepared for greeting your baby. This is our comprehensive course which includes all 16 sessions, totaling in over 18 hours. 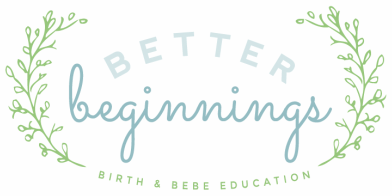 In this course, we will provide you with all the building blocks to a safe, satisfying, and empowered birth experience. Covering everything from prenatal nutrition to pain management techniques for labor to breastfeeding. See class descriptions for details. We provide several payment options. A 50% deposit is required to register. The balance will be due upon completion of the first class. If you would prefer to pay in full, that option is available below. We are very pleased to have partnered with Natasha Woodard of Gulf Coast Doula. Natasha and Bianca have been working together for over three years. Bianca is not taking doula clients at this time, but we feel confidant that our clients will receive caring & professional care from Natasha. ​All Better Beginnings clients who also hire Natasha will receive a $50 discount on doulas fees AND a 20% discount on all better beginnings classes. Please contact Bianca directly to register for the courses and received the discounted rate. If you have limitations that prevent you from attending our Building Blocks for Birth course or you have a very specific need, we can help by providing customized consultation. Kate or Bianca will meet with you in person to provide information, tools or teach skills. The topics covered are determined by your specific needs. Some examples could include: Nutrition & Fitness, Birth Plans, Relaxation Techniques, Hospital Practices & Protocols, Comfort Measures, or Breastfeeding. As your postpartum doula, our goal is to support you as a mother. Depending on your situation, we will tailor a set of tasks to best meet your need. When setting the appointment, we can discuss what services would be the most beneficial for your specific situation. We can do a mix of things or focus on only one, such as breastfeeding. Here are some of the ways, you may want us to serve you.